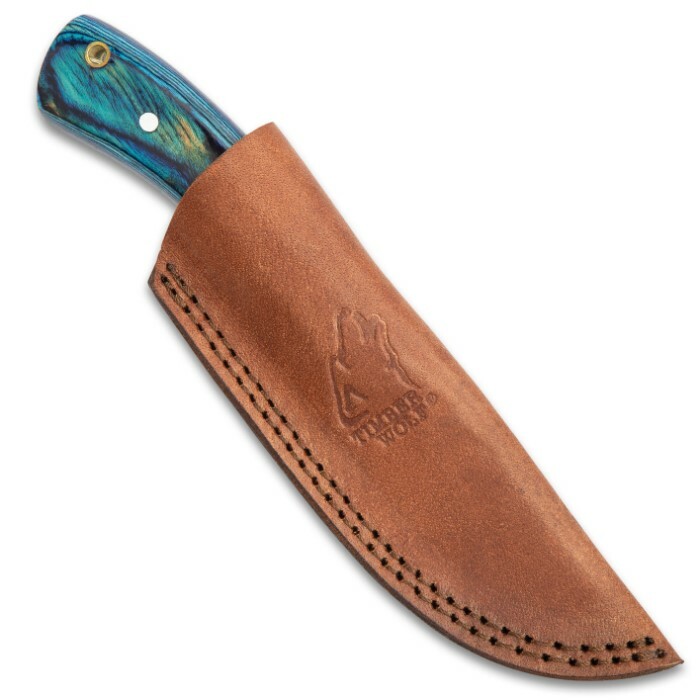 Timber Wolf Blue Elijah Carbon Steel Skinner Knife with Leather Sheath | BUDK.com - Knives & Swords At The Lowest Prices! 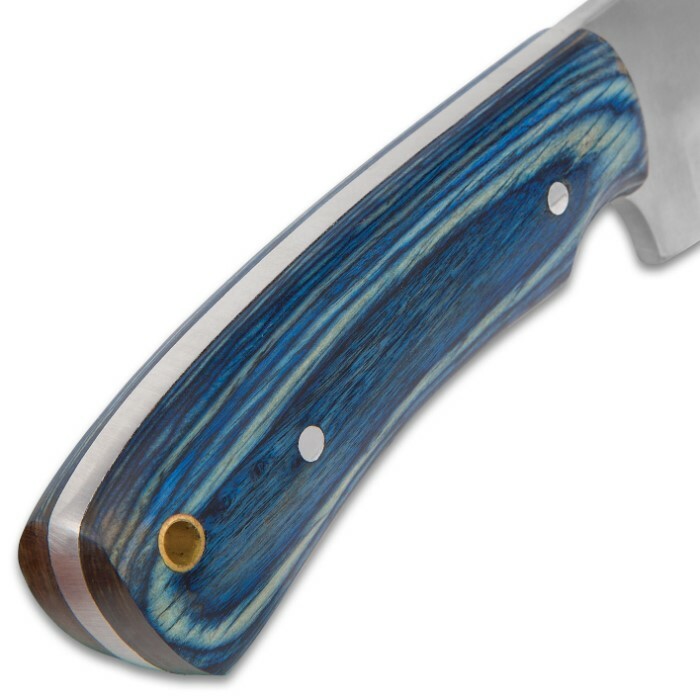 Extraordinarily versatile, Timber Wolf's "Blue Elijah" Skinner provides supreme control for delicate cutting tasks, yet packs more than enough muscle to tackle the big jobs, as well. It features a 4 1/4" skinner blade forged from exceptionally resilient high carbon steel. A thumb notch on the blade spine and a handy niche for your index finger allow for maximum dexterity while skinning, caping, woodcarving and performing other fine knife work. Carefully honed to a razor's edge, the blade makes quick work of thick rope, branches, field dressing game and other demanding chores, as well. The handsome hardwood handle is gently stained a rustic lapis blue, affording the look of weathered barnwood. Smartly contoured and silky smooth, the handle boasts an outstanding hand feel that lets you whittle, carve, scrape, slice and cut to your heart's content with minimal fatigue. The Blue Elijah fits snugly in the included genuine leather sheath, which includes a belt loop for comfortable transport in the field. You can also secure it via the convenient brass-lined lanyard hole on the knife handle. 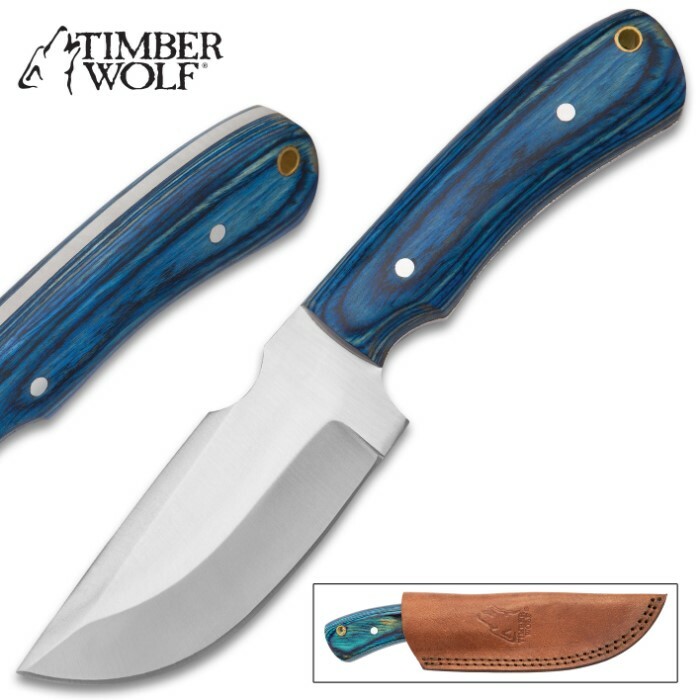 Ideal for hunters, trappers, anglers, hikers, all around outdoorsmen and collectors alike, Timber Wolf's Blue Elijah Skinner is a must-have field companion for any job, in any environment.